BEAT egg whites and 1/4 cup sugar in large mixer bowl until stiff peaks form. COMBINE egg yolks and remaining sugar in large bowl; beat until light yellow in color. Fold egg white mixture and flour alternately into egg yolk mixture. COMBINE sweetened condensed milk, media crema, evaporated milk, brandy and vanilla extract in medium bowl; stir well. PRICK top of cake thoroughly with wooden pick. POUR 2 cups cream over cake. Spoon excess cream from side of pan over top of cake. LET stand for 30 minutes or until cake absorbs cream. Remove side of pan. BEAT cream, sugar and vanilla extract in small mixer bowl until stiff peaks form. It says intermediate but read the recipe carefully before starting. Get your ingredients measured out, etc. Then it is not difficult. This is a real tres leches cake. The texture was perfect. I would recommend a tsp. of vanilla to the cake mix to round out the flavor. Don't forget to add fresh fruit to yours, to make it more delicious and pretty. Sliced stawberries, kiwis and peaches or cantaloupe if you don't like peaches, and honeydew melon. Definately will make again! This looks like fun to make for Cinco de Mayo class party, instead of the usaul chips and salsa! This is a delicious recipe, but as I saw what someone else wrote, it is a "wet" cake. I made it for a Cinco de Mayo school activity one year and the teachers (and students) asked me to make it the next year. It is one of our family's favorites! 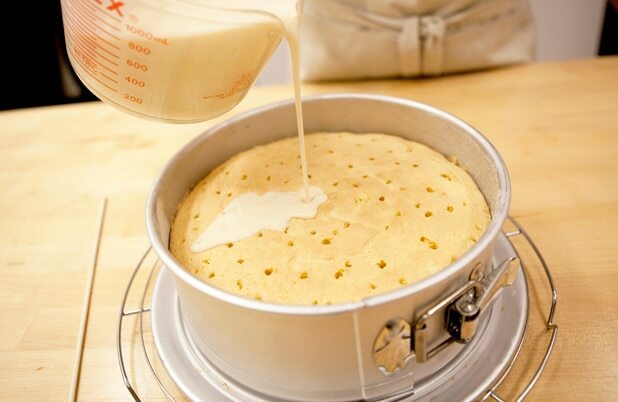 If you want the cake less "wet", don't add the liquid over the cake; let each person put their cake in a bowl or deep plate, and pour the liquid first and sit the cake on top. It keeps it from getting soggy, which some people don't like. But, for me, that is what Tres Leches is...a milk cake! I am a Spanish teacher and served this cake at a teacher luncheon. It was a huge hit! Gracias! good, but a little soggy for my taste. did not have brandy so I used rum. I added more sugar to sweeten the topping as it didn't taste great.